Advancing its goal to make browsing the Web from mobile devices a reality, W3C recently launched two MWI groups: the MWI Device Description Working Group is rechartered to enable the development of globally accessible data and service repositories for use in content adaptation, and the new MWI Test Suites Working Group is to help create a strong foundation for the mobile Web through the development of a set of test suites targeted at browsers. 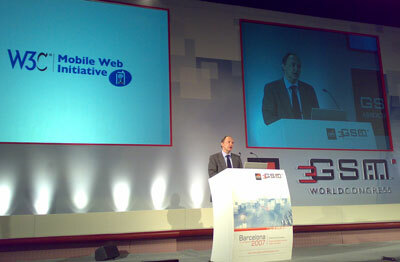 The latter group is specifically supported by the 3GWeb project of the European Commission's IST Program. W3C team staffed a booth in the 3GSM'07 exhibition. The latest achievements of W3C's mobile Web work were presented, and visitors were able to learn how to mobilize Web content following the Mobile Web Best Practices (MWBP) guidelines and using its associated online checker. A popular handout were the MWBP flipcards, which is a set of cards summarizing the guidelines of that document in ten themes.